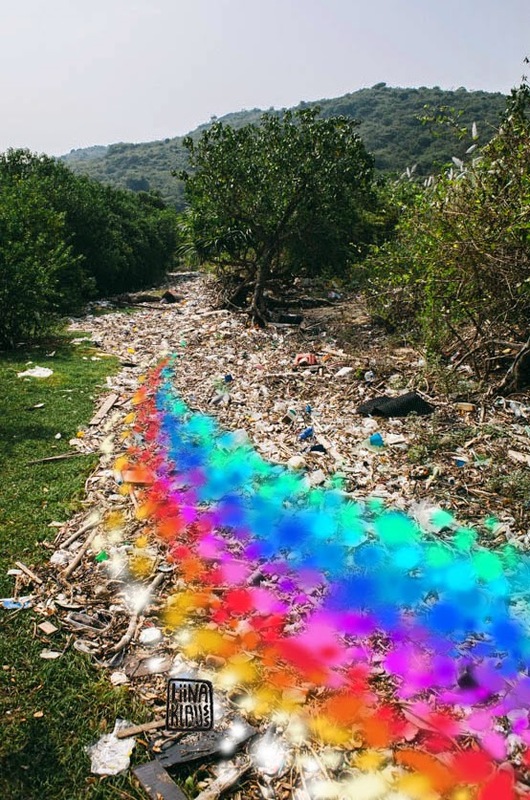 liina klauss is supporting Plastic Free Seas' swim challenge with an art installation: liina will be painting a huge stream of colours made entirely from waste washed ashore. Please come and join: you can help collect colours of waste, coordinate the hues and shades or directly help laying out the art work. Because of the huge dimensions of the art work we will continue and complete the installation on Saturday 1st Nov.
On Saturday we will complete the installation and take pictures: please help spread the pictures on social networks so as many people as possible will get in contact with this sad reality! 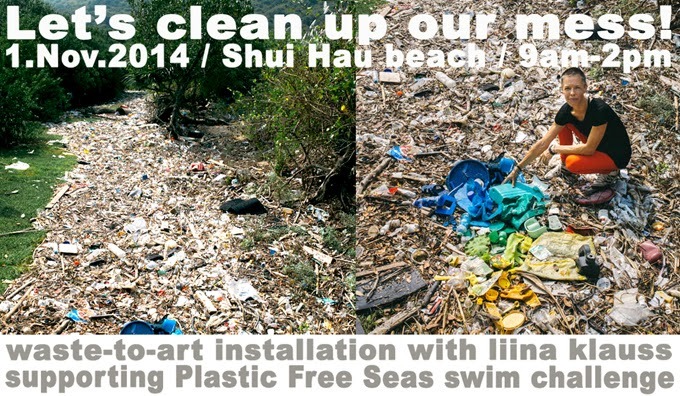 On Shui Hau and many of Hong Kong's beaches, we need as many helping hands as possible to clean up. Plastic Free Seas swim challenge will have Bruce Pye and his Coach Olivier Baillet swimming 75km around Lantau Island. On Saturday 1st, their fouth day swimming, they will arrive on Shui Hau beach. Don't miss it! <--- Painting a beautiful picture of an ugly truth! On that day we'll all be painters and we'll be creating a huge stream of colours to make everyone see this reality. Don't forget your camera! From Mui Wo: Bus No.1 (to Tai O) or No.2 (to Ngong Ping). From Tung Cheung: Bus No.11 (to Tai O) or No.23 (to Ngong Ping). Tell the bus driver you want to get off at "Shui Hau Wan beach" or "kite-surfing beach" and follow the signs from there.